1. Lysterfield Lake - This is arguably Melbourne's best freshwater swimming spot and is a very popular family destination during the warmer months of the year. It boasts pristine water quality, public BBQ facilities, picnic tables, plenty of shade and it's own sandy beaches. 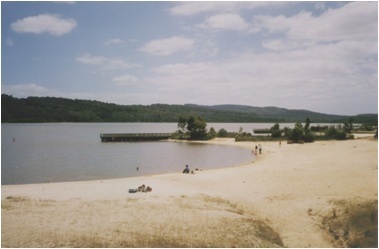 The lake is located in Melbourne's eastern suburbs, with entry off the Belgrave-Hallam Road. It is also popular for mountain biking, bushwalking and other passive water sports. Get there early on hot days because the car park can fill up quickly. The park is open 8am to 8pm. 2. 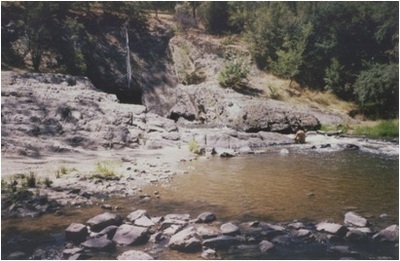 Pound Bend - The Pound Bend Tunnel in the Yarra River at Warrandyte forms a natural spa. Lay yourself down on the rock bed and let the waters gushing through the tunnel bubble over you. For a gentler swim, the waters from the tunnel rejoin the deeper main stem of the Yarra River a few metres downstream. Steer clear of the Yarra in the 48 hours after rain due to poor water quality,but on hot days, you wouldn't want to be anywhere else. Other sites - The Melbourne metropolitan area is sadly lacking in other fresh water swimming holes due to poor water quality in our waterways. If these two options do not satisfy you, then try any number of public pools for a chlorinated swim, go to the Kerferd Road Beach in South Melbourne for a salty swim, or head for the cleaner rivers and lakes outside the metropolitan area. Why? Take a dip in one of the city's freshwater swimming holes.